The First World War was so gruelling and devastating for the brave men and women involved, that many pictures can be hard to look at. The photographs we have included on this page are not as graphic as some you will see, but they are certainly up there with the most interesting. The first thing you will notice is that they are all in colour. We have the Open University to thank for this. 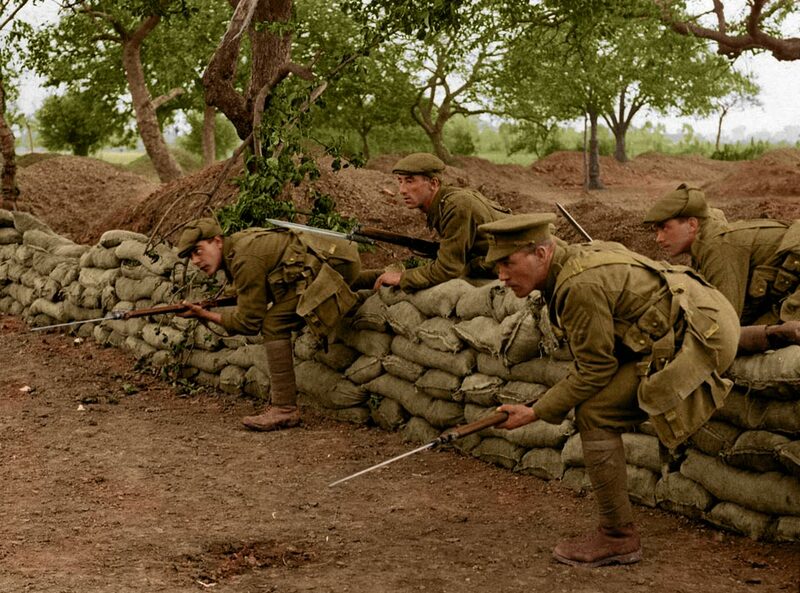 They worked with specialists to turn the original black and white photographs into colour images as a way of commemorating the First World War Centenary. See these new pictures below alongside our own description and analysis of each image. 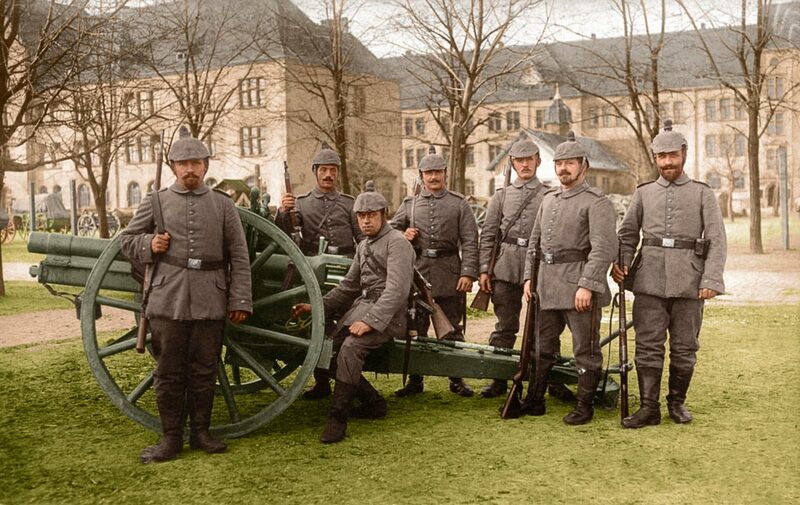 Above: Soldiers from the German Field Artillery Regiment in 1914. About the picture: This images depicts soldiers from the German Field Artillery Regiment. Their iconic grey uniforms are clear to see in colour. The gun they are posing with is Feldkanone 96 field gun (7.7cm). Although there are seven men in the picture it only took five to operate a Feldkanone 96. About the picture: You will notice that this is a relatively small group of soldiers to be leaping out of a trench. That is because it is a listening post. The soldiers are not going over the top. In fact this photo may well be staged, but it is not clear. About the picture: The First World War was the first time manufactured chemical weapons like poisonous gas had been used in warfare. 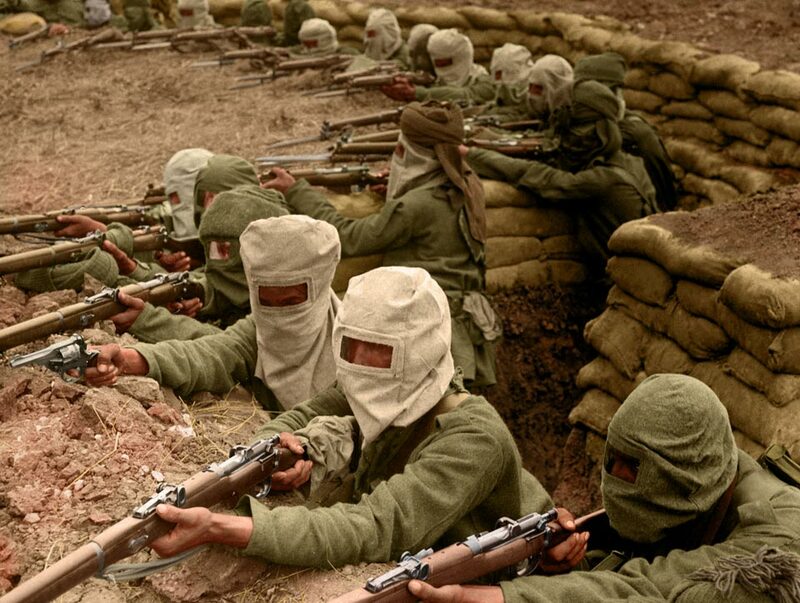 The gas masks worn in the pictures above by members of the Indian Infantry are a primitive design. The hoods shield the highs but soldiers wearing masks like this were still very much at risk. 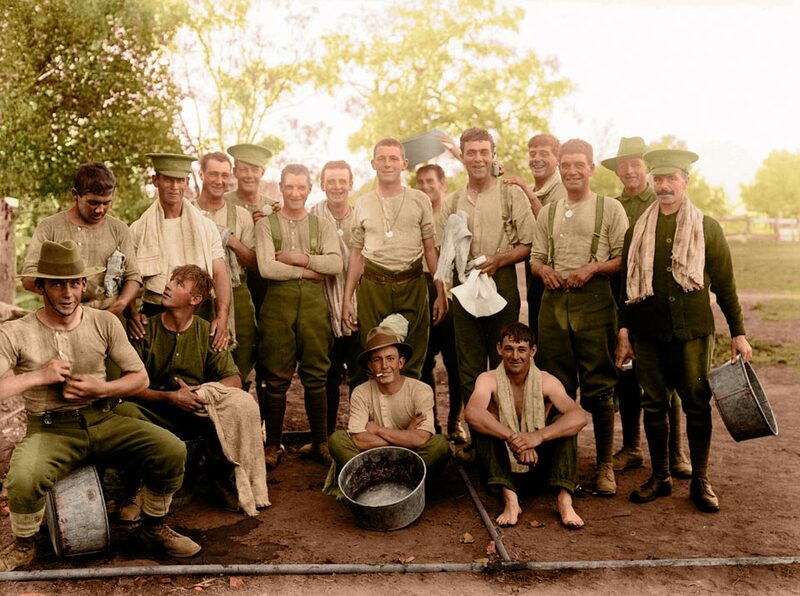 About the picture: Not everyone is aware of Australia’s role in WW1. It may be along way from Europe but 60,000 Australians gave their life for the allied cause. They prepared for their roles by attending training camps like the one seen in this photograph. Above: Albanian Front 1918. 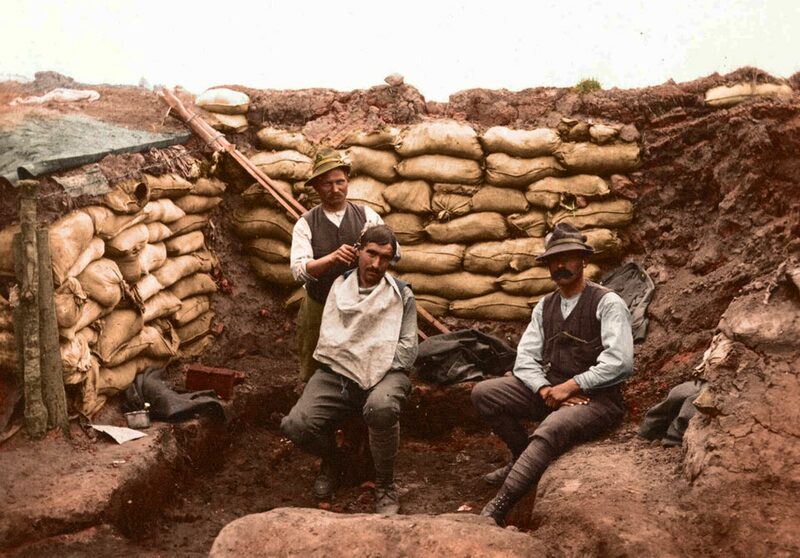 A soldier is given a haircut in the trenches by a local man. About the picture: Even when at war on the front-line soldiers needed to get their haircut. Locals would often pitch offer their services to help out, like this barber is doing on the Albanian front. About the picture: There were all sorts of animal mascots in World War 1. Some as large as bears, others as small as glow worm. 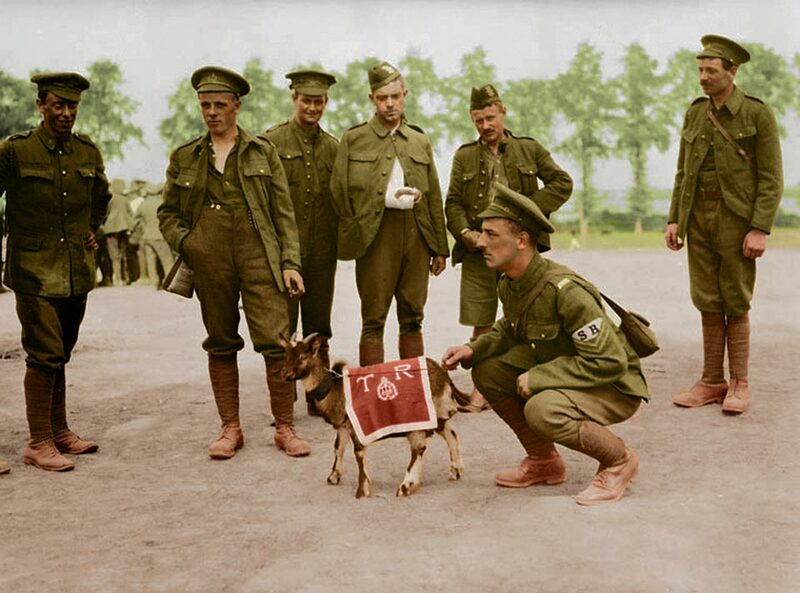 The 3rd Canadian Infantry Battalion had a goat as you can see in the picture above. His minder was the stretcher bearer. About the picture: This is a very nice image to finish with. 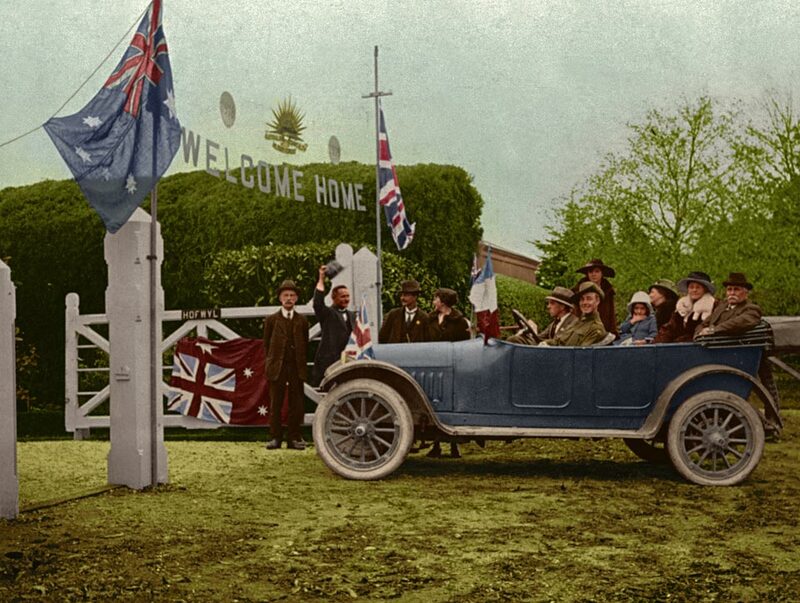 It shows Cleveland Frank Snoswell, an Australian soldier, being welcomed home from the war by a group of his family and friends. The colour re-touching really brings the photograph to life. Great site! How do I go about finding info on soldiers in WW1? I found a Georg Gondorcsin born 1882 in Havaskoz and died on September 21 1916. This is the info I have, LstInfst., IR NR 66, zugeteilt dem IR. Nr 55 13 Komp, also a Lazslo Gondorcsin Ind., Jli. 18 I Erskoinp., Schubiid. 1. Oberschenkel k.k. Laiidwchispiial. These are relatives that I know nothing about and I want to learn about them. What they did, where they were and where to find their grave sites. The pics are great as they were useful for a powerpoint presentation. Hey, this info is very useful as at school I had a project and it helped me loads!! That’s good because all of these are awesome!